Size of this preview: 599 × 599 pixels. Other resolutions: 240 × 240 pixels | 3,000 × 3,002 pixels. 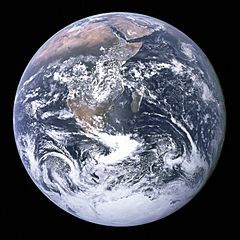 Description: "The Blue Marble" is a famous photograph of the Earth taken on December 7, 1972, by the crew of the Apollo 17 spacecraft en route to the Moon at a distance of about 29,000 kilometres (18,000 mi). It shows Africa, Antarctica, and the Arabian Peninsula. This page was last modified on 15 February 2019, at 09:14.